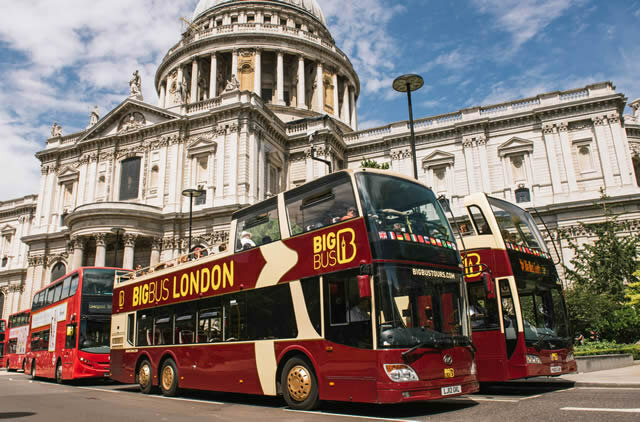 The Big Red Bus Tours are the easiest ways to explore the city of London all in one afternoon. The London Big Red Bus Tours allows visitors to hop on and off at any point as the tour wanders through London taking in important London attractions such as Buckingham Palace, Big Ben, London Eye and more. Big Red Bus Tours offers visitors to London a great range of tour tickets such as hop on and off tickets for anywhere between 1 day to 3 days as well as walking tours, river cruises, night tours and fast track entry to the London Eye. Browse their offers and tour tickets by clicking here. The nearest bus stop to the New Linden Hotel for the big red bus tours is in Notting Hill. The Blue Tour stops in Notting Hill every 10-15 minutes while the first bus arrives at 08:13 and the last bus stops in the area at 18:35. The Blue Tour explores the West of London and the tour is available in 12 different languages. The blue tour takes in sights and attractions such as Marble Arch, Mayfair, Hyde Park, Harrods, South Kensington as well as Notting Hill. Once you have finished your day of exploring the city of London on the Big Red Tour Bus, return to the New Linden Hotel in Notting Hill where you will be treated to modern and comfortable accommodation in a brilliant central London location. Book direct on our site for the best rates and offers.